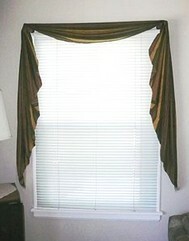 Purchasing valances for your windows can be expensive, but make your own scalloped fishtail valance with this free sewing pattern and you can save hundreds of dollars. Read through the pattern first to understand the steps before beginning to measure and cut your fabric. Fabric – the width of your window plus twice the window length. Finials / knobs / pull back hooks for the upper corners of your window. Add A + B + B. Square the ends of your fabric. Cut straight across the squared end. You can use a carpenter’s square, T-square or similar tool to help with this. Transfer Measurement C to your fabric. Cut the second end square also. Hem the selvedge edges to hide the selvedge. Hem the two short ends. 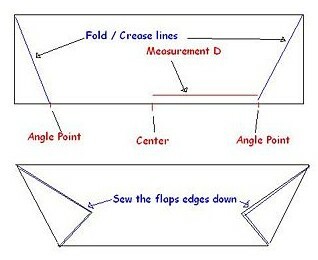 Find and mark your folded angle using the following steps. Fold your fabric in half, short end touching short end. Add 10 inches (25 cm) to your window width measurement above (Measurement A) and divide in half to get a length we’ll call Measurement D.
Transfer measurement D to your folded material. Measure and mark its length FROM THE CENTER mark. Place two pins to mark Measurement D’s distance from the center mark in each direction. You now have your angle point marked. Fold the fabric at the angle point, pulling the corner of the fabric over until the crease of the fold runs from the angle point to the opposite corner. Sew/hem the fabric edges down. Your material should be a longish trapezoid at this point. If using, sew or glue any desired edge trim to the three shortest sides of your trapezoid. Install your hanging knobs or hooks at the top corners of your window opening. 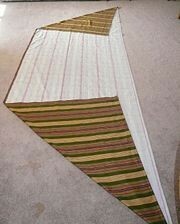 Lay your fabric, “right side” or pattern side up on a flat surface. Pleat the material, starting from the narrowest long side (top) of the trapezoid. You should end up with a thick, long, narrow bunch of pleated fabric. Hang your pleated fabric over the two knobs/hooks with the narrowest edge facing down and the longest edge against the wall. Allow the pleated fabric to sag slightly in the center. Pull the back (longest) edge of the fabric taut against the wall and thumb tack it into place. Tweak the pleats into a pleasing symmetry and you’re done! Plain wood finials can be stained and used for your window corners in lieu of more expensive swag hooks and knobs. Adapted from an article on wikiHow, a wiki how-to manual. All content on wikiHow can be shared under a Creative Commons license.